The rapper celebrated with her husband, rapper Offset. Cardi B is making chart moves as well as money moves. The 25-year-old rapper, whose real name is Belcalis Almanzar, has become the first female rapper to have two number one hits on the Billboard Hot 100. 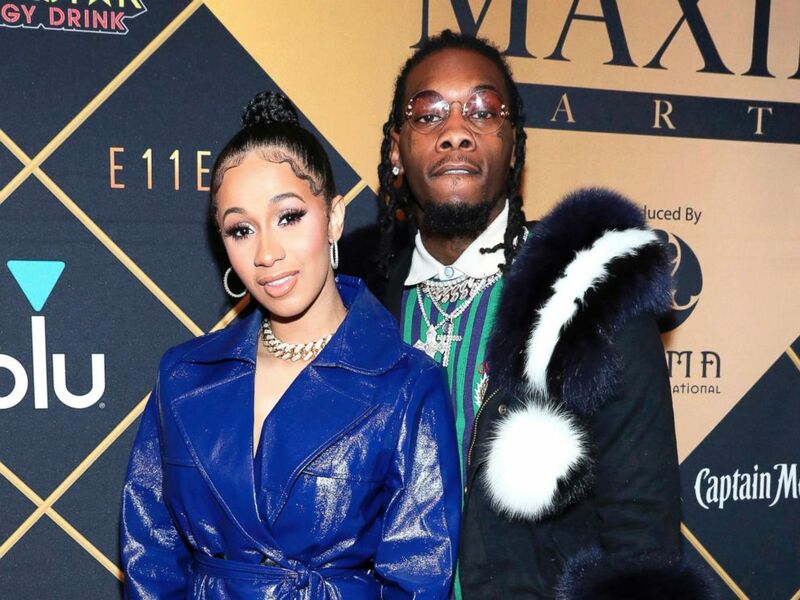 A pregnant Cardi celebrated her historic feat in an Instagram video while riding in a car with her husband, Offset. "Number one. Ahh, I’m so excited!!!" she screamed. "'I Like It' went number one, number one on the Hot 100. I’m so excited. Now we just waiting on baby girl." Cardi and Offset are expecting their daughter later this month. 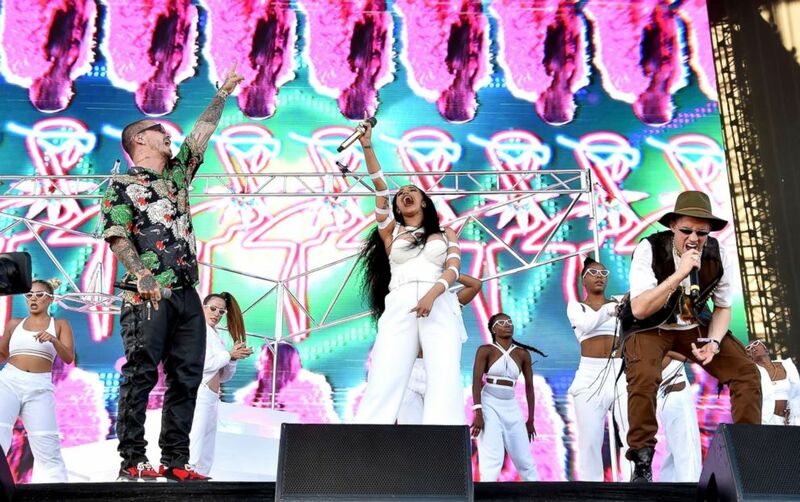 (Kevin Mazur/Getty Images for Coachella) From Left, Balvin, Cardi B, and Bad Bunny perform during the 2018 Coachella Valley Music And Arts Festival on April 22, 2018, in Indio, Calif.
Cardi’s “I Like It,” featuring Bad Bunny and J Balvin, moves up from number two to number one, changing places with last week's top song, “Sad!” by XXXTentacion. Cardi previously reached number one with her debut hit, “Bodak Yellow,” which remained at the top of the chart for three weeks beginning October 7, 2017. Only four other female rappers previously topped the Hot 100: Lauryn Hill with "Doo Wop (That Thing)" in 1998' Lil' Kim on "Lady Marmalade" with Christina Aguilera, Mya and P!nk in 2001; Shawnna, as a featured artist on Ludacris' "Stand Up" in 2003; and Iggy Azalea with "Fancy" featuring Charli XCX in 2014. Cardi B is the only female solo artist with two Hot 100 number ones from a debut album this decade, and the first since Lady Gaga in 2009. (Omar Vega/Invision via AP) Cardi B, left, and Offset arrive at the Maxim Super Bowl Party in Minneapolis, Feb. 3, 2018. The rapper recently confirmed that she and Offset, a member of the hip hop group Migos, were secretly married last year. Last week, they feted their first child together at a lavish baby shower featuring a decadent layered cake, a book library and a live band. BARDI Shower? ?Thank you everybody for coming .I really appreciated with all my heart and will never forget ya !!? ?I haven’t been able to open gifts today cause i haven’t been feeling too good ,tomorrow i will see ! !Even this the best gift of all was your presence ??????????????? ?